Is Coherent, Inc. (NASDAQ:COHR) A Good Stock To Buy? We can judge whether Coherent, Inc. (NASDAQ:COHR) is a good investment right now by following the lead of some of the best investors in the world and piggybacking their ideas. There’s no better way to get these firms’ immense resources and analytical capabilities working for us than to follow their lead into their best ideas. While not all of these picks will be winners, research shows that these picks historically outperformed the market when we factor in known risk factors. Coherent, Inc. (NASDAQ:COHR) investors should be aware of a decrease in activity from the world’s largest hedge funds in recent months. COHR was in 13 hedge funds’ portfolios at the end of the third quarter of 2018. 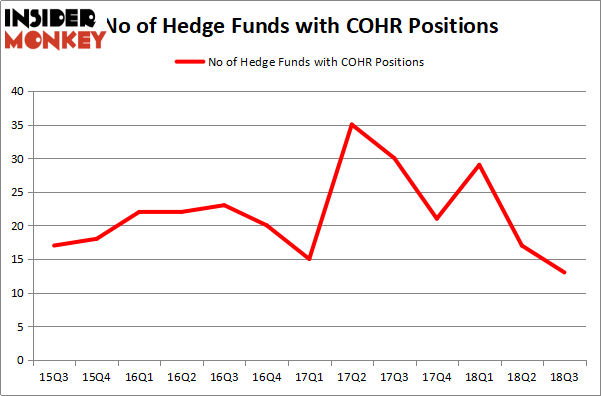 There were 17 hedge funds in our database with COHR holdings at the end of the previous quarter. Not only that the stock is seeing less optimism from large hedge funds in our system, it also hasn’t been attractive to billionaires that we track (to see what stocks have captured their attention, check out our list of 30 stocks billionaires are crazy about: Insider Monkey billionaire stock index). Still, this data is far from enough to make a conclusion about whether this stock is a good buy or not, so we’ll further examine it. While VulcanValue Partners holds the opinion that Coherent, Inc. (NASDAQ:COHR) is a good buy, we need further convincing. That’s why we’ll inspect the hedge fund activity regarding this stock further more, and also compared it with other companies of similar market caps. At the end of the third quarter, a total of 13 of the hedge funds tracked by Insider Monkey were bullish on this stock, a change of -24% from one quarter earlier. Below, you can check out the change in hedge fund sentiment towards COHR over the last 13 quarters. So, let’s examine which hedge funds were among the top holders of the stock and which hedge funds were making big moves. 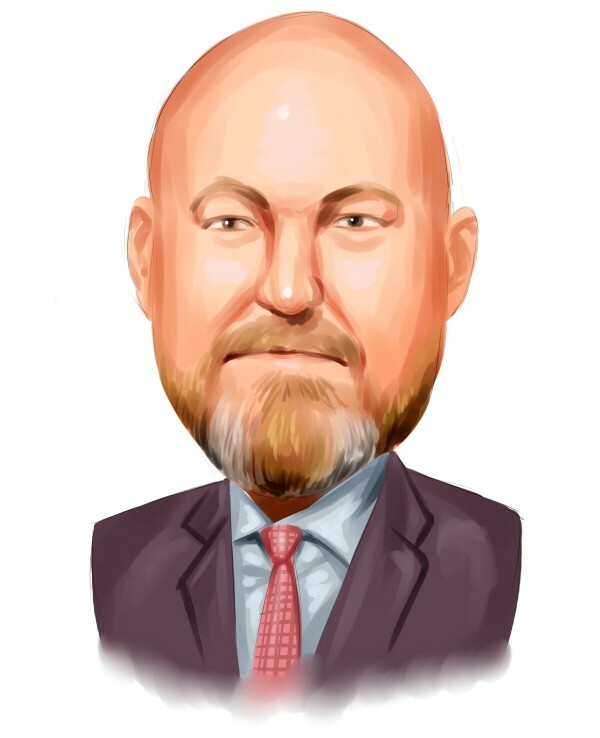 Of the funds tracked by Insider Monkey, AQR Capital Management, managed by Cliff Asness, holds the number one position in Coherent, Inc. (NASDAQ:COHR). AQR Capital Management has a $42.1 million position in the stock, comprising less than 0.1%% of its 13F portfolio. Sitting at the No. 2 spot is Skylands Capital, led by Charles Paquelet, holding a $37.6 million position; the fund has 4.9% of its 13F portfolio invested in the stock. Some other peers that hold long positions encompass Chuck Royce’s Royce & Associates, and D. E. Shaw’s D E Shaw. Judging by the fact that Coherent, Inc. (NASDAQ:COHR) has experienced declining sentiment from the aggregate hedge fund industry, it’s safe to say that there is a sect of hedge funds that decided to sell off their entire stakes in the third quarter. It’s worth mentioning that Jim Simons’s Renaissance Technologies dropped the biggest position of the 700 funds watched by Insider Monkey, comprising about $23.9 million in stock. Noam Gottesman’s fund, GLG Partners, also dumped its stock, about $9 million worth. These transactions are important to note, as aggregate hedge fund interest fell by 4 funds in the third quarter. Let’s check out hedge fund activity in other stocks similar to Coherent, Inc. (NASDAQ:COHR). We will take a look at MAXIMUS, Inc. (NYSE:MMS), MEDNAX, Inc. (NYSE:MD), Senior Housing Properties Trust (NYSE:SNH), and Texas Capital Bancshares, Inc. (NASDAQ:TCBI). This group of stocks’ market values match COHR’s market value. As you can see these stocks had an average of 20 hedge funds with bullish positions and the average amount invested in these stocks was $419 million. That figure was $109 million in COHR’s case. MEDNAX, Inc. (NYSE:MD) is the most popular stock in this table. On the other hand Senior Housing Properties Trust (NYSE:SNH) is the least popular one with only 13 bullish hedge fund positions. Compared to these stocks Coherent, Inc. (NASDAQ:COHR) is even less popular than SNH. Considering that hedge funds aren’t fond of this stock in relation to other companies analyzed in this article, it may be a good idea to analyze it in detail and understand why the smart money isn’t behind this stock. This isn’t necessarily bad news. Although it is possible that hedge funds may think the stock is overpriced and view the stock as a short candidate, they may not be very familiar with the bullish thesis. In either case more research is warranted. Already Up 48% in 2018, Bill Ackman Sees Bigger Gains Ahead for Chipotle Mexican... Hedge Funds Waiting to See What Marvin Ellison Has in Store for Lowe’... Hedge Funds Aren’t So Sweet On Mondelez International Inc (MDLZ) Anymore... Hedge Funds Like What Restaurant Brands International Inc (QSR) is Cooking The Howard Hughes Corporation (HHC): Hedge Fund Ownership Hits 2-Year Low Is Agilent Technologies Inc. (NYSE:A) A Good Stock To Buy?